Adopting Industrial Internet of Things (IIoT) technologies to improve environmental sustainability ranks as a crucial priority for transportation and logistics companies, according to a new Inmarsat study. 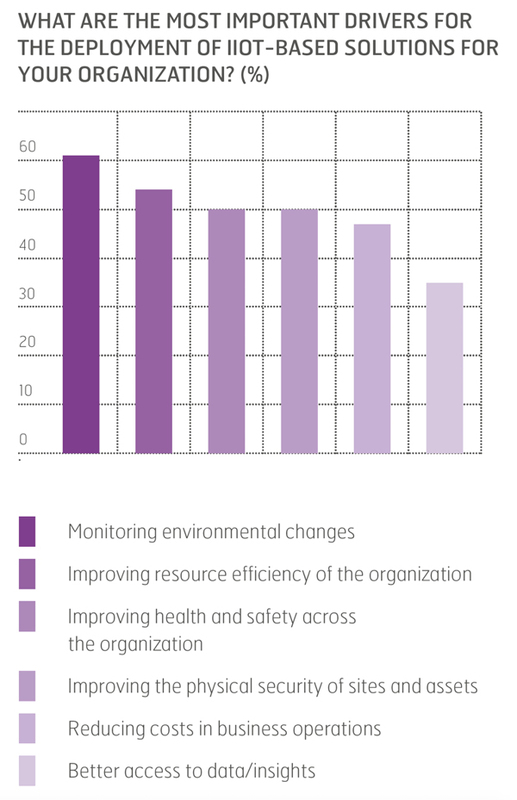 Across the transportation and logistics sector, the two largest drivers behind adopting IIoT-based solutions are monitoring environmental conditions such as emissions and air quality (61 percent) and improving resource efficiency (54 percent), the research reveals (see chart). The good news is that many transportation and logistics companies are realizing their sustainability objectives through the use of IIoT. Seventy-five percent of respondents with fully deployed or trial-stage IIoT solutions report they are improving environmental sustainability.